Textile Worker for 38 years. Stripper and grinder, then textile technician with English Card Clothing Company. Textile Technician at Crosses and Heaton Ltd. He was orphaned at the age of six and brought up by his sister Mary and then by sister Pat and her husband Tom. Served in Middle East, North Africa during the Suez Crisis. Lance Corporal, Royal Army Medical Corps 1956-58. Chairman of Highways, Environmental Health, Youth Services. Buildings opened as Mayor included the Atlantis Club, Esporta and many at the Middlebrook development. 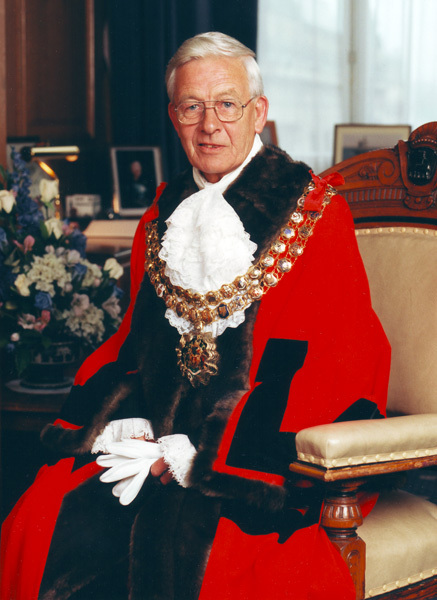 Worked through part of his term as Mayor with his leg in plaster after a holiday accident. Chairman of Governors of three primary schools in Westhoughton. Had five children. Three girls and two boys. One daughter was killed in a road traffic accident aged 14 in 1982. His partner, Rita Fairhurst, was Mayoress. 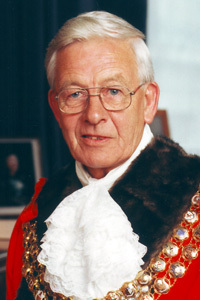 Formal portrait of Peter Louis Finch as Mayor of Bolton.